The endless debates surrounding Chicago’s educational institutions have taken the grand stand in Chicago politics. It can be a disheartening landscape. Video Parachute was happy to help draw attention to a program that is a positive light, taking action to really make change for Chicago’s youth: High Jump. High Jump is an academic enrichment program that serves motivated 7th and 8th grade students who are of limited economic means. Started in 1989, the program has a long list of success stories, years of students who were given a chance to reach their true potential. Keeping families and communities involved from day one, engaging the student on so much more than just memorization. High Jump recently celebrated it’s 25th Year and wanted to do something different to commemorate their history. They wanted to put together more than just another promotional video. We worked with them to develop a video that not only celebrated their current program but also the now over a thousand alumni. We wanted to exhibit the scope of what High Jump was doing. So we reached out to the alumni and spent weeks collecting interviews. 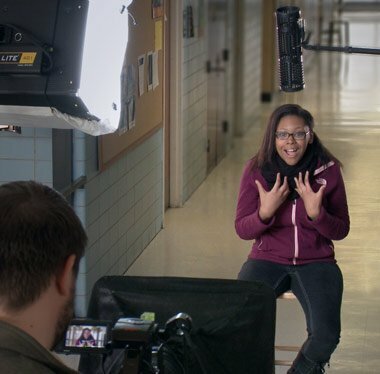 Instead of shooting the interviews in a studio, we chose to move around Chicago to the very schools these alumni went through the High Jump program. We got to see these success stories come full circle as they told us about where they are and how High Jump helped get them there. We shot with multiple camera, keeping at least one dynamic to match the energy of these inspired youth. We gathered some great material, so much so that even after the completion of our video we are in discussions of ways display all the unused material on social media. visit the High Jump website for more information.